As a result of the credit crunch/economic downturn/recession, whatever you want to call it, there has been a boom in car-boot sales, apparently. 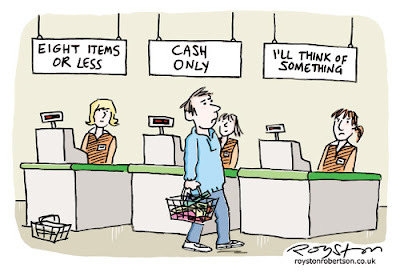 This cartoon accompanies a local newspaper article on that very topic this week. When you do on-spec cartoons for magazines, you find that you have certain favourites that you're sure will sell, but never seem to. 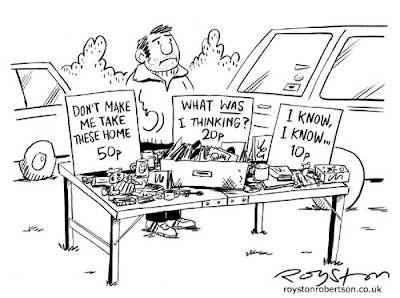 This cartoon, which I originally drew 14 months ago (though it was redrawn for the paper, mainly to make the signs bigger and clearer) was one of those. It did the rounds. I suppose the problem for the magazine market was that it is not a "boom boom" joke, as such, more a humorous aside about the kind of tat that people try to get rid of at boot sales. So it works better in an illustrative capacity, accompanying an article on the same subject. The "three-sign" joke is one I've used several times. Here are two examples, from Private Eye and Reader's Digest. 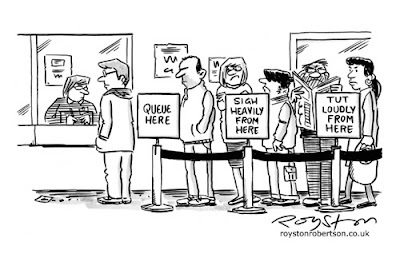 I'm fairly convinced that's me standing behind the 'queue here' sign in the Private Eye gag. But then I also think there's Richard Tomes in the queue. And Roger Penwill reading the paper looking extremely angry. I'm starting to see cartoonists everywhere. It's a bit worrying. You're like Haley Joel Osment, but with cartoonists instead of dead people. 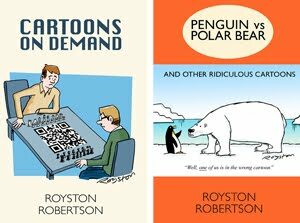 Royston I don't know which I like more - your drawings or your wit! I get something to chuckle about every time I visit this blog! Weather cartoon: Cold enough for ya?